The biologics or a biopharmaceutical product means a pharmaceutical semi synthesized from different biological sources. In contrast to completely synthesized drugs, biologics are generally made up of living cells, gene components, sugars, proteins, nucleic acids, tissues, allergenic, and also vaccines. The useful components listed above are isolated from living sources and combined, to cure the disease with minimal side effects. Biologics products often represent the pioneer developments in biotechnology research and often aid medical practitioners in treating a variety of illnesses and conditions which presently have no other treatments available. Other factor such as the ability of biologics to facilitate complete cure of a disease with minimal side effects is boosting the growth of the market. Geographically, biologics have registered near double digit annual growth rate, whereas, the pharmaceutical drugs registered only single digit annual growth rate, in the past five years. This double digit growth was largely fuelled by the substantial investments of the major pharmaceutical companies, who realized the potential of the market quite early. The research study comprises of extensive analysis of various factors effecting the global biologics market. The entire market has been estimated and validated through three different approaches namely, by product, by therapeutic areas and by geographical destination. In terms of product, the market has been categorized into monoclonal antibody (mAbs), hormones, growth factors, fusion proteins, cytokines, therapeutic enzymes, vaccines, blood factors, and anticoagulants. The mAbs are the dominating other types in terms of sales and therapeutic enzymes is the highest growing type. In terms of therapeutic areas the market is segmented into oncology, cardiovascular, immunological diseases, infectious diseases, and metabolic diseases. The market is dominated by oncology related products and infectious diseases related products are expected to grow at the highest rate. In terms of geography, the market was segmented into North America, Europe, Latin America, Middle East, Africa and Rest of the World. In terms of sales, North America currently dominates the other geographical regions whereas, Middle East and Africa together are expected to grow at the highest rate. The key players which have significant contributions to the biologics market are F. Hoffmann-La Roche AG, Pfizer Inc., Novartis AG, Sanofi, Merck & Co., Inc., Johnson & Johnson, GlaxoSmithKline plc, AstraZeneca plc, Gilead Sciences, Inc., AbbVie Inc., Amgen Inc., Lilly,Bristol-Myers Squibb, Novo Nordisk, Merck KGaA, Allergan, Plc, Boehringer Ingelheim GmbH, Astellas Pharma Inc., Teva Pharmaceutical Industries Ltd., Bayer AG, and Biocon Ltd. The report presents the reader with an opportunity to unlock comprehensive insights with respect to the market and helps in forming well informed strategic decisions. The research uncovers some of the substantial parameters that must be taken into consideration before entering into the global biologics market. • What are the major market drivers, challenges and opportunities in the global biologics market and their case studies? • How did the biologics market evolve and what is its scope in the future? • What is the market share of the leading segments and sub-segments of the global biologics market in 2016 and 2025? • How will each segment of the global biologics market grow during the forecast period and what will be the revenue generated by each of the segments by the end of 2025? • Which geographical location will contribute to the highest sales of biologics? 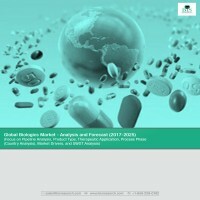 This research report aims at answering various aspects of the global biologics market with the help of key factors driving the market, threats that can possibly inhibit the overall market growth, and the current growth opportunities that is going to shape the future trajectory of the market expansion. The study considers the growth-share matrix model for a comprehensive study of the global biologics market and assesses the factors governing the same. 7.15. Merck & CO., Inc.
27 Overview: Astellas Pharma Inc.
30 Overview : Biocon Ltd.
35 Overview : GILEAD SCIENCES, INC.
38 Overview : Merck & CO., Inc.
42 Overview : Pfizer Inc.
44 Overview : Teva Pharmaceuticals Industries Limited. A biologic drug or biopharmaceutical mean a pharmaceutical product semi synthesized from different biological sources. In contrast to completely synthesized drugs, biologics are generally made up of living cells, gene components, sugars, proteins, nucleic acids, tissues, allergenics, and also vaccines. The useful components listed above are isolated from living sources and combined using recombinant DNA (rDNA) technology, to cure the disease with minimal side effects. Biologics involve complex manufacturing procedures and are required to be maintained at pre-determined conditions as they are highly sensitive to changes in ambience. Consequently, companies need to invest huge amounts in terms of capital, to meet the standards, which will eventually increase the cost of biologics. The introduction of biologic therapies gave a new ray of hope for people suffering from chronic inflammatory diseases. Biologics effected their life not only by reducing dependency on health and welfare systems but also by improving their physical function to live independently. The entry of biosimilars makes these effective therapies more affordable, though the concern of after effects still exists. Some industry experts also express their caution regarding the entry of biosimilars, which might add to the concerns of safety and after effects of the therapies. The research report analyses various factors effecting the global biologics market and forecasts the growth of the biologics market. In the report, the entire market has been estimated and validated through three different approaches namely, by product, by therapeutic areas and by geographical destination. In addition, the report also provides insights about present pipeline of the key players having significant contributions to the market, expiry period of patents of top products dominating the market and their impact on the market after patent expiration. The global biologics market generated a revenue of $238.8 billion in 2016. Introduction of targeted therapies coupled with rising adoption of patient centric personalized medicine is expected to fuel the demand for biologics drugs in the future. Moreover, ever-increasing understanding of the cell physiology and stress, as well as the factors involved in protein production and heterologous gene expression have empowered the use of different living factories in the development of novel therapeutic biologic drugs. This gain will largely be driven by robust growth in the emerging markets and increasing adoption of monoclonal antibodies (mABs) and human insulin for the treatment of patients. In addition, governments in some markets (including the U.S. and Europe) have introduced biosimilar pathways as a measure to further the competition in this area. In 2016, mAbs maintained their ranking as the highest selling class of biologics, with their U.S. sales reaching ~$37.6 billion, an 18.3% growth over their 2015 sales, vaulting Roche, with 11 monoclonal in the market, into the top spot among companies with biologic products. The growth of the mAbs sector was driven by a high growth in the sales of both mAbs for oncology and anti-inflammatory disorders. The biologics or biopharmaceutical products find their application across wide range of therapeutic areas namely, oncology, cardiovascular, immunological diseases, infectious diseases, and metabolic diseases, among others. The growing awareness of biologics and its efficiency in treating deadly diseases has nudged small molecule drugs out of the top positions in terms of sales. The biologics find their application especially in the field of oncology. The biologics pipeline include many of its products devoted to oncology and its related diseases. With its high incidence rate of 70% over next two decades, and present burden over the society makes cancer a critical issue needed to be dealt with strict measures to reduce the number of prevalent cases. Biologics help in curing cancer types of disseminated disease or internally located tumors which are difficult to be treated through conventional methods such as radiotherapy and surgery. In 2016, the biologics market for cancer and other therapeutic treatments was valued at $238.8 billion, predominantly represented by monoclonal antibodies. The biologics market for cancer is anticipated to reach $155 billion by 2025. Apart from cancer, immunological diseases, cardiovascular and metabolic diseases represent the majority of the shares of the global biologics market. In 2016, immunological diseases was the second largest application segment after oncology, with $66 billion in sales. Both the North American and European markets are dominating the other markets in terms of biologics sales, followed by Asia Pacific. However, due to the technological advancements in healthcare and toxicology in other markets such as Asia Pacific, it is expected to take over the top position in terms of biologics sales. The current biosimilars market is dominated by Europe which was driven by technically advanced healthcare infrastructure and high patient awareness & regulatory harmonization. Due to high incidence rates of diseases in the emerging markets, many companies are investing huge sums in these markets to address the unmet needs of the patients. All the developed markets except the U.S., are contributors to the total biosimilars sales. Most of the players in biosimilars market remain focused on the developed markets only. In past decade, China’s pharmaceutical market has witnessed a double digit growth. This has attracted several major pharmaceutical companies to commercialize their products in China. But the major barriers for foreign companies are regulations binding the Chinese markets and cultural differences as well. Therefore, partnership with the local companies was the only option left to the foreign companies to commercialize their products in the region. The report provides in-depth SWOT analysis of different key players of the market, supported by extensive financial summary of each. Some of the key players are F. Hoffmann-La Roche AG, Pfizer Inc., Novartis AG, Sanofi, Merck & Co., Inc., Johnson & Johnson, GlaxoSmithKline plc, AstraZeneca plc, Gilead Sciences, Inc., AbbVie Inc., Amgen Inc., Eli Lilly and Company, Bristol-Myers Squibb GmbH, Novo Nordisk, Merck KGaA and Allergan, Plc.